International Journal of Food Microbiology, 266, 2018, s. 42–51. Journal of Food Protection, 81, 2018, č. 8, s. 1313–1320. ISSN: 0362-028X (Print) 1944-9097 (Online). Food Chemistry, 244, 2018, č. , s. 349–358. ISSN: 0308-8146 (print), 1873-7072 (online). EuroFIR Guideline on calculation of nutrient content of foods for food business operators. Food Chemistry, 238, 2018, č. , s. 35–41. FEMS Microbiology Letters, 365, 2018, č. 23, article fny257. Food Control, 83, 2018, Special Issue, s. 85–89. Antonie van Leeuwenhoek Journal of Microbiology, 111, 2018, č. 10, s. 1913–1923. Food Hydrocolloids, 81, 2018, č. , s. 113–119. Journal of AOAC International, 101, 2018, č. 6, s. 1864–1867. Food Control, 83, 2018, Special Issue, s. 118–122. Journal of Food and Nutrition Research, 57, 2018, č. 1, s. 27–37. ISSN: 1336-8672 (print), 1338-4260 (online). Journal of Food and Nutrition Research, 57, 2018, č. 2, s. 195–200. Journal of Food and Nutrition Research, 57, 2018, č. 4, s. 373–383. Journal of Food and Nutrition Research, 57, 2018, č. 2, s. 170–178. In: Frias, J. – Martinez Villaluenga, C. – Penas, E. (Eds. ): Fermented foods in health and disease prevention. London : Academic Press, 2017, s. 417–432. Chemical Papers, 71, 2017, č. 9, s. 1605–1621. ISSN: 2585-7290 (print), 1336-9075 (online). Journal of Food Processing and Preservation, 41, 2017, č. 4, e13084. ISSN: 1745-4549 (online). DOI: 10.1111/jfpp.13084. Journal of Food Safety, 37, 2017, č. 2, e12315. 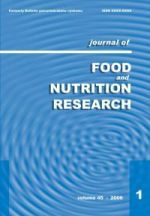 Journal of Food and Nutrition Research, 56, 2017, č. 4, s. 381–388. In: Gökmen, V. (Eds. ): Acrylamide in food : Analysis, content and potential health effects. 1. vyd. Amsterdam : Elsevier, 2016, s. 405-421. In: Lubyová, M. – Filčák, R. (Eds. ): Globálne megatrendy. Hodnotenie a výzvy z pohľadu Slovenskej republiky. 1. vyd. Bratislava : Centrum spoločenských a psychologických vied, Slovenská akadémia vied, 2016, s. 128–155. Food Analytical Methods, 9, 2016, č. 7, s. 1980-1984. Journal of Food Processing and Preservation, 2016, Early View. Journal of Food and Nutrition Research, 55, 2016, č. 3, s. 278–281. ISSN (print): 1336-8672, ISSN (online): 1338-4260. Czech Journal of Food Sciences, 33, 2015, č. 2, s. 118–125. International Journal of Environmental Health Research, 25, 2015, č. 4, s. 384–392. Journal of Luminescence, 160, 2015, č. 1, s. 71–77. Journal of Food and Nutrition Research, 54, 2015, č. 2, s. 165–170. Journal of Food and Nutrition Research, 54, 2015, č. 4, s. 308–313.